Located at 9830 Georgetown Pike in Great Falls, VA, the garden was designed, installed and is now maintained by Club members. In addition to beautifying the library, the garden demonstrates the use of native and deer-resistant plants. The garden features a beautiful dry-stacked stone retaining wall along the outer edge to enhance the gently sloping hill. Weekly maintenance is done by Club members throughout the growing season. 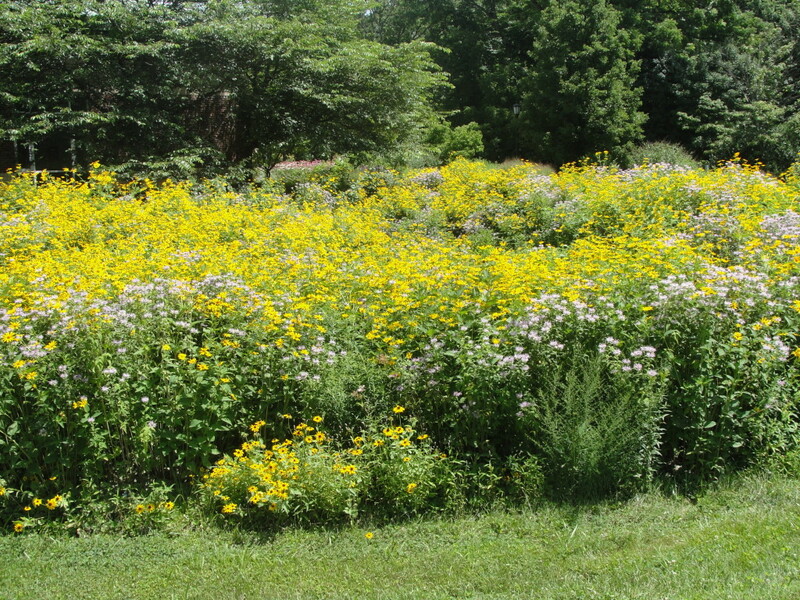 Planted in 2011, the meadow fills a 10,000 SF storm water retention pond in front of the library. Not only is it a beautiful addition to our town’s main street, the meadow provides food and shelter for a host of birds, bees, butterflies and even deer; it hides the unsightly concrete culverts and drain pipes; slows and filters the storm water draining through it; and serves as a Monarch Butterfly Way Station. Dedicated in May, 2013, it is a formal garden in our Village Green Center that honors veterans of our local community who have served in the military. It’s maintained by the members of the Club.